huiMAU's Second Annual Community Celebration of Lā Hoʻihoʻi Ea in Paʻauilo. 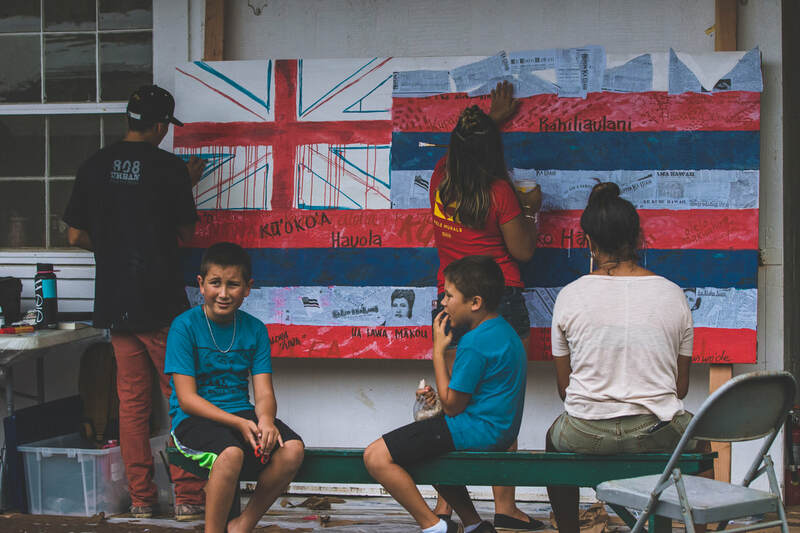 For the second year in a row, hundreds from Paʻauilo and our surrounding communities gathered together to celebrate Hawaiʻi’s first national holiday, Lā Hoʻihoʻi Ea. On this 174th anniversary of the day that ea (life, breath, sovereignty, independence) was returned to this ʻāina, Hui Mālama i ke Ala ʻŪlili (huiMAU) organized its second annual gathering to bring our community together for this important holiday, on Saturday, July 29, 2017, in Hauola, Hāmākua. For months leading up to the event, drought conditions had fallen upon Hāmākua, drying up food crops and turning pastures brown. 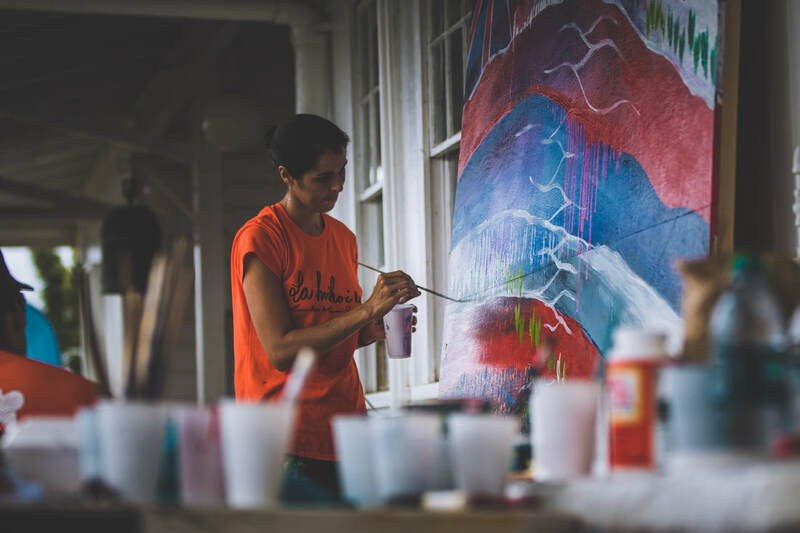 After months of prayer lifted up for the return of rain to this ʻāina, the “ea o ka ʻāina” returned on Lā Hoʻihoʻi Ea in the form of Hāmākua’s famous Pupūhale rain—bringing life back to this ʻāina, and a breath of fresh air to a community whose well-being is intimately tied to “ke ea o ka ʻāina.” As the rain clouds slowly rolled across the skies in Paʻauilo, our kūpuna called us to move the gathering indoors, to the Paʻauilo Hongwanji, where the century-old gathering place for our community provided a safe, welcoming space for kūpuna and keiki to engage in the day’s festivities and educational activities. 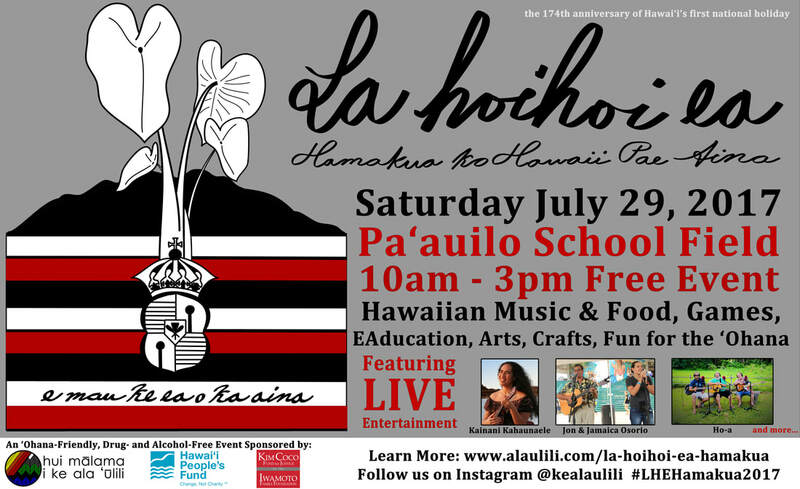 This year’s Lā Hoʻihoʻi Ea Hāmākua featured live entertainment by Paʻauilo’s youth and some of Hawaiʻi’s most-celebrated Hawaiian musicians and educators, local food and craft vendors, educational booths, and live art demonstrations. 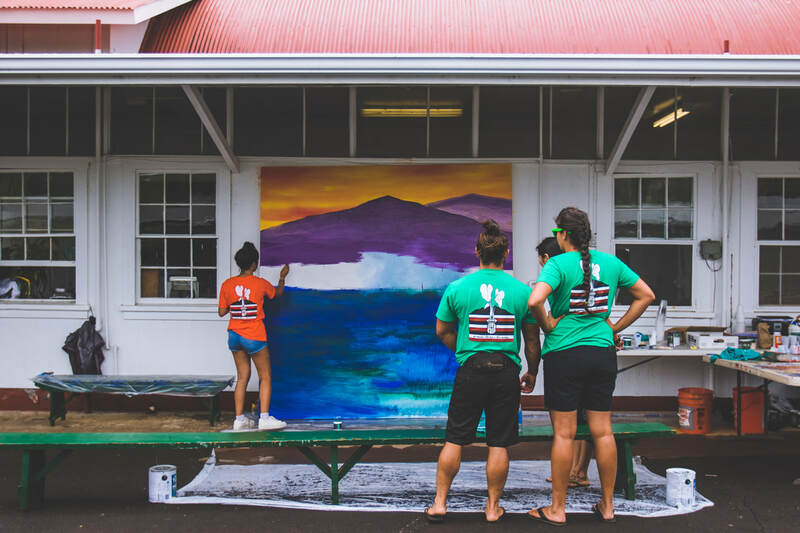 One of the most beautiful ways that our community demonstrated our ea at this gathering was through the practice of kuʻi ʻai (poi pounding). 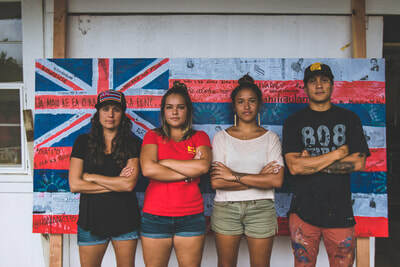 Thanks to over 200lbs of kalo, cultivated, cared for, and donated by the caretakers of kīpuka ʻāina in Hāmākua (and one on Oʻahu)—Aunty Jenn Holani and her Honokaʻa High School students at Paʻalaea; Dave Sansone at The Kohala Center Farm in Honokaʻa; Derrick Kiyabu at GoFarm in Honokaʻa; Kaleo Wong and Hikaʻalani at Ulupō in Kūkanono, Kailua, Oʻahu; and our own HoAMa After School and Summer Program keiki in Paʻauilo—our Lā Hoʻihoʻi Ea celebration was filled with the rhythmic sounds of pōhaku and papa kuʻi ʻai (poi pounders and boards), children’s laughter, kūpuna’s tears of joy, and the mūkā of lips enjoying freshly made paʻi ʻai. 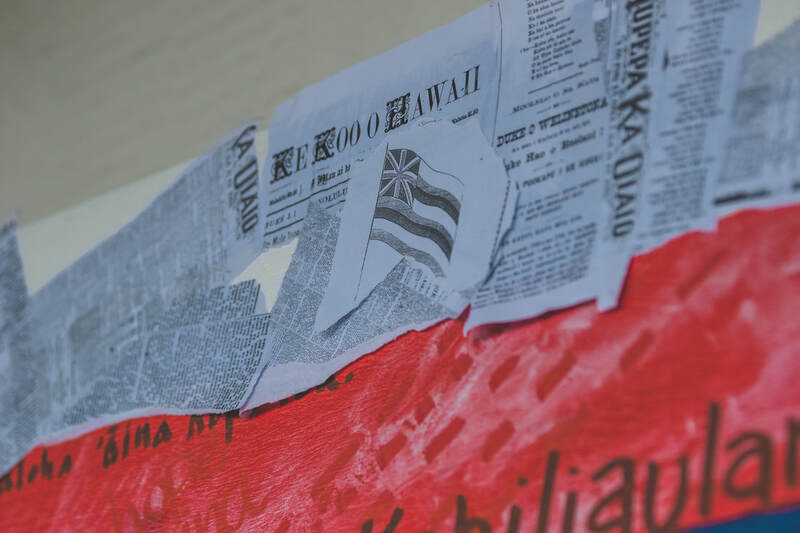 As one of our speakers for day, Kaleomanuiwa Wong, reminded us, “Pau ke kalo, pau ke Kanaka” (If kalo ceases to exist, so too will Hawaiians). 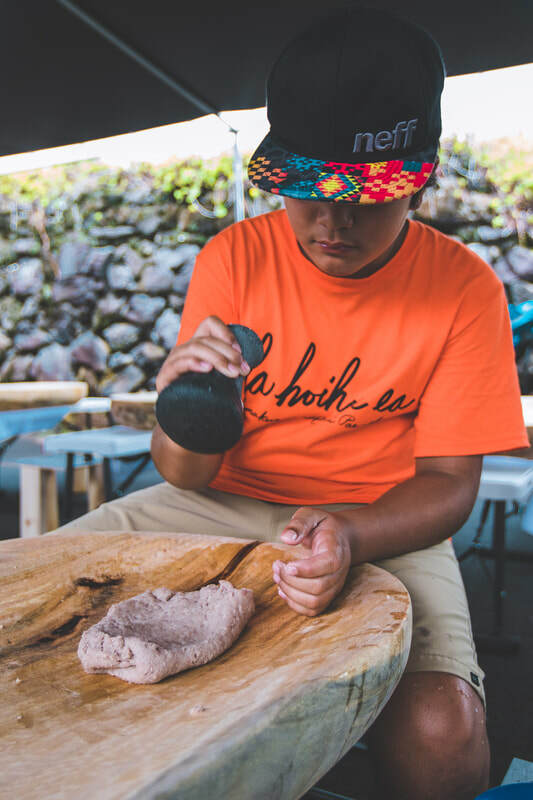 Witnessing our keiki joyfully preparing paʻi ʻai to serve the kūpuna present at the gathering reaffirmed that here in Hāmākua, the legacy of Hāloa lives on vibrantly in his descendants. “Kū ke kalo, kū ke Kanaka,” Kaleomanuiwa said. 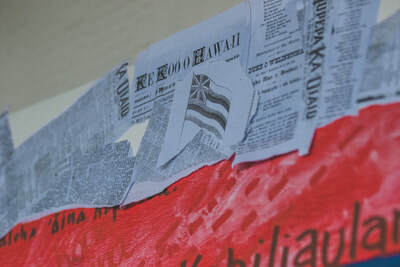 When the kalo thrives, so do Kānaka. Ola Hāloa. Ola Hāmākua! 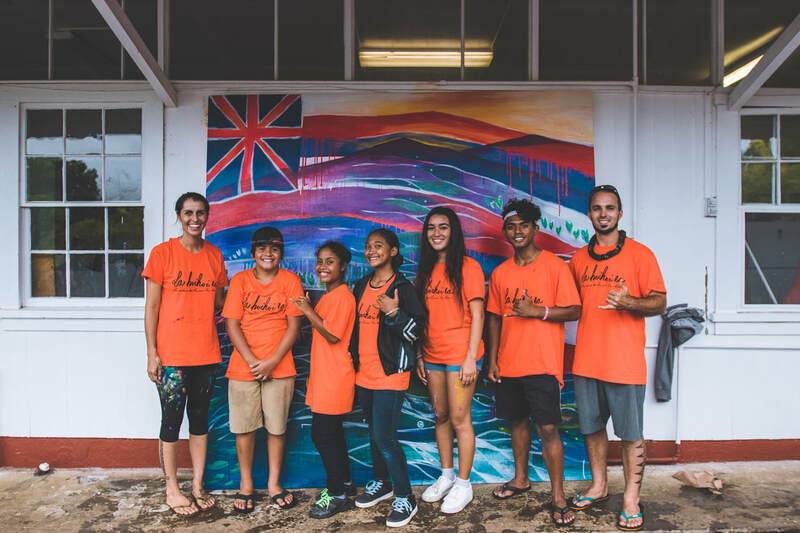 Just a few feet away from our kuʻi ʻai tent filled with people, young and old, sharing intimate time with Hāloa, was another impressive display of our community’s ea. 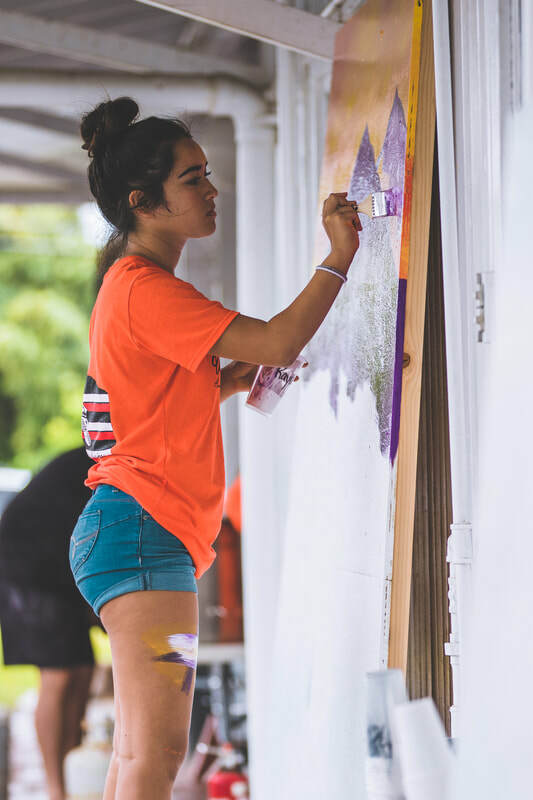 Led by young ʻŌiwi artists, Haley Kailiehu, Kaila Razonable, Kanoa Castro, Kalua Castro, and Hoʻāla Arts Students from Kanu o ka ʻĀina, two murals were painted, live, on-site throughout the day. 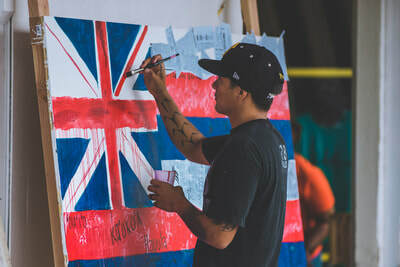 The murals depicted artistic expressions of ea—the life sources of our ʻāina and lāhui—including such beloved symbols of Hawaiʻi’s independence as the Hae Hawaiʻi (Hawaiian flag), Liliʻuokalani, Hawaiian language newspapers, and Maunakea. 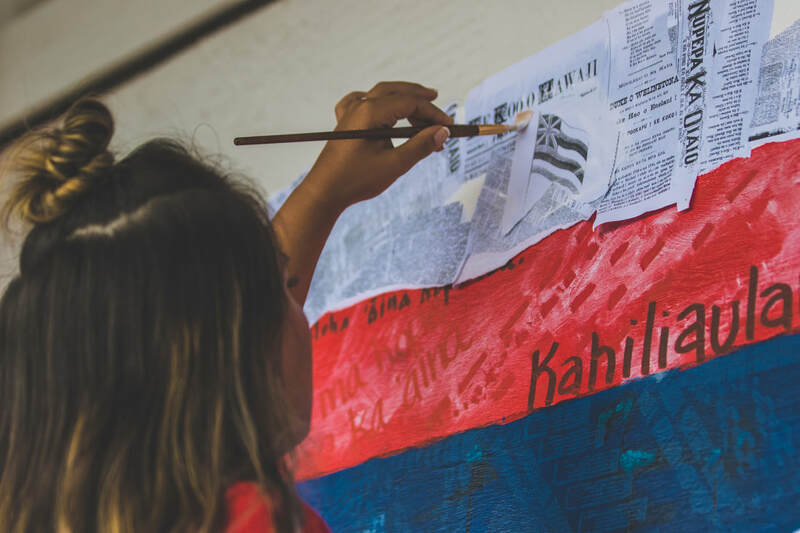 One of the murals—a large depiction of the Hawaiian flag—included messages and names written on it by folks gathered at the event, honoring ʻāina, lāhui, and their steadfast caretakers from Hāmākua and all Hawaiʻi, past, present, and future. 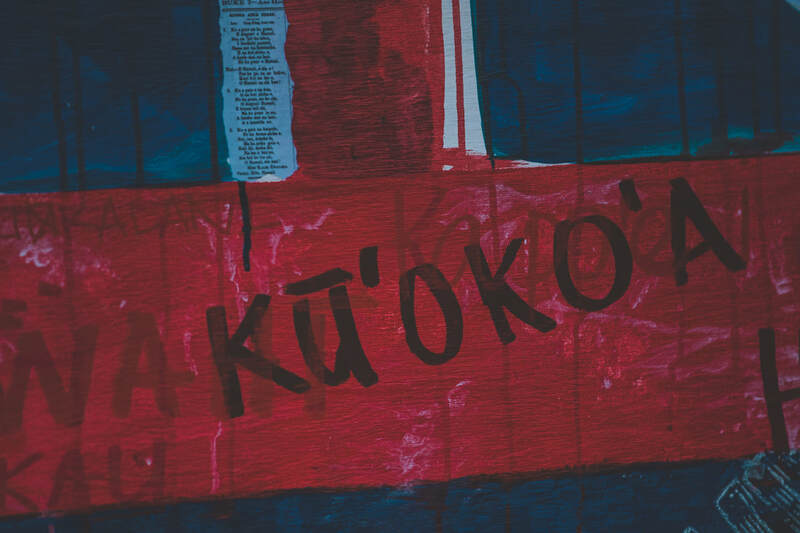 Some of these messages included: “Ua mau ke ea o ka ʻāina i ka pono” (Kamehameha III’s famous words on the first Lā Hoʻihoʻi Ea in 1843); “Ua lawa mākou i ka pōhaku” (“We are satisfied with the stones,” a verse from the famous song of resistance, “Kaulana Nā Pua”); “Kūʻokoʻa,” (Independence); “Aloha ʻĀina,” (Love the Land); Hauola (the name of the ahupuaʻa in which our event took place); Kahiliaulani (honoring Charles Kahiliaulani Notley, former president of the Independent Home Rule Party in the early 1900s, whose home was near the current site of the Paʻauilo Hongwanji); “ʻOiaʻiʻo” (Truth); “Mau ke aloha no Hawaiʻi” (Our aloha for Hawaiʻi endures); and “Ea mai ko Hāmākua” (Hāmākua’s people are rising). As we gathered together in a large circle at the end of the day, approximately 300 of us in total, singing “Hawaiʻi Aloha,” hand in hand, it became clear that our community in Paʻauilo and Hāmākua is indeed rising together. This is how we ea. “This is not about sitting here and waiting [for ea to be returned to us],” as Aunty Kū Kahakalau, our emcee for the day, reminded us. 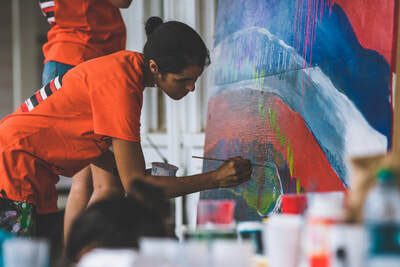 “This is about doing things. This is about us talking about it. 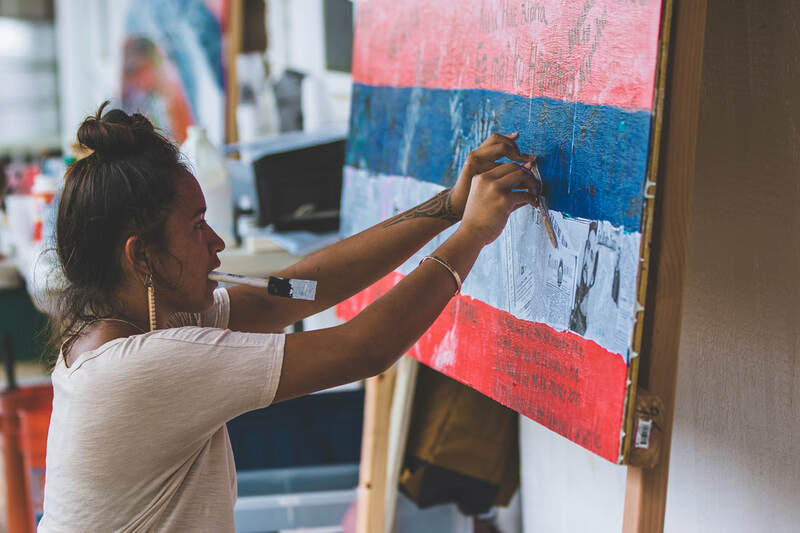 This is about us playing…and singing about it…and educating ourselves about our history.” Weaving relationships like lauhala; painting visions like vivid murals; feeding each other paʻi ʻai; and sharing the very best we have to offer of moʻolelo (stories), mele (songs), and aloha. This is how we ea. 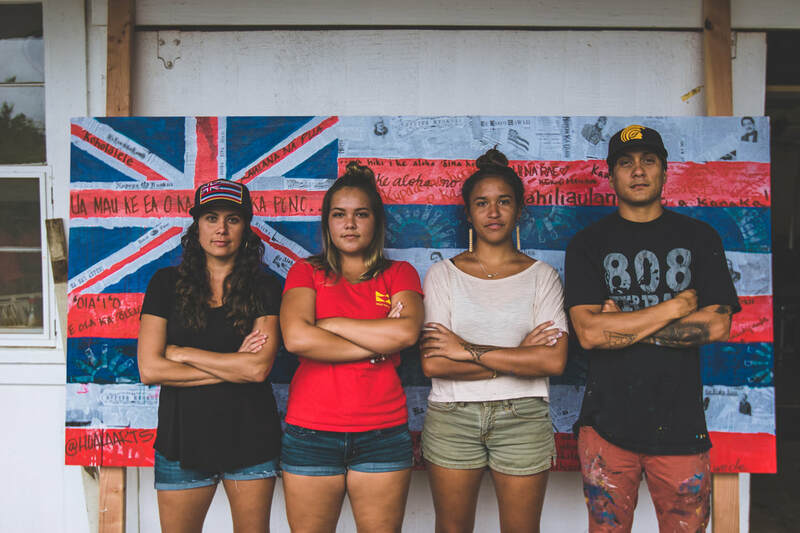 A lāhui (nation) is built by many hui, many ʻohana, many hands working together, breathing together, rising together. Ea mai ko Hāmākua! Ea mai ko Hawaiʻinuiākea! A special mahalo to our event sponsors!